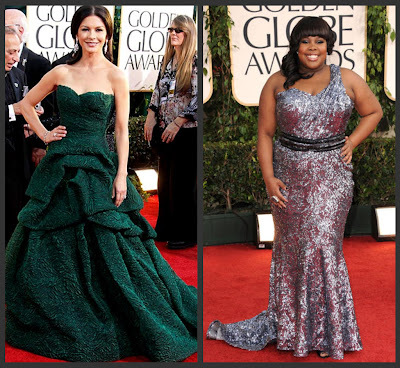 This year's red carpet fashion for the Golden Globes was largely successful. If we think about how much time and effort goes into deciding what dress is worn, how the hair will be done and what kind of makeup will polish off the entire look, we would be nervous too! Millions of people watch these award shows and the choice of dress only adds to the competition of the night. Catherine Zeta-Jones image via People. Amber Riley image via OMG! 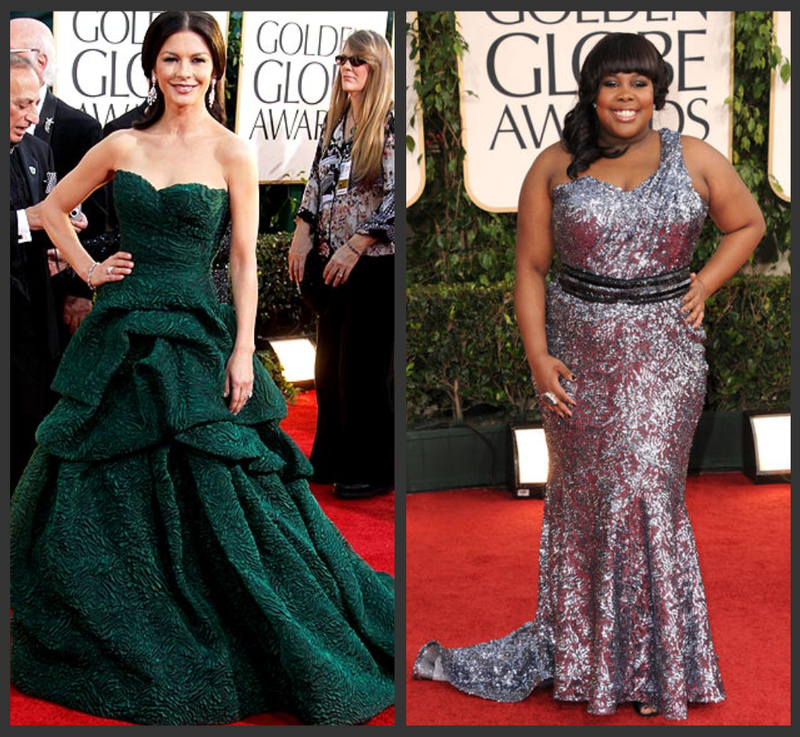 My runner-ups are worn by Catherine Zeta-Jones and Amber Riley. The forest green of Catherine Zeta-Jones' Monique Lhuiller ball gown looks so elegant against her skin and the wonderful draping cascades beautifully. Amber Riley's lively dress from Oliver Tolentino hits her in all the right places and fits her shape so well. I also adore that she designed her own earrings for the night! My love also goes to the dresses on January Jones and Kyra Sedgwick. They are wearing bold colors that many would shy away from. No other designer but Versace could create a classy AND revealing v-neck cut-out dress as worn by January Jones (the original design of the dress came in blue!). The contrast between her unconventional dress with her old-Hollywood hair is a nice touch. Kyra Sedgwick's orange Emilio Pucci dress is easy elegance at its best. The ruffles that surround her gives enough oomph without extra accessories and the vibrant color upgrades its "wow factor." My final ramble is given to the adorable Hailey Steinfeld and the talented Lea Michele. While not a show stopping dress, Hailey Steinfeld looks appropriate for her age with her pulled back hair and classic ivory dress. She kept things simple and classic, which is always a plus! Lea Michele's Oscar de la Renta's dress reminded me of a mix of Cameron Diaz's 2009 Golden Globe dress and 2009 Oscar dress. I like how she is wearing her hair up so there is nothing competing against her one-shoulder dress. Definitely a look to remember. Personally, I enjoyed the actors' anecdotes and the amusing acceptance speeches. I smiled when the speech came from the heart (and sighed a bit if the speech was pre-written). I enjoyed having a "viewing session" and discussing all the nominations/winners. The Golden Globes are especially fun because it combines the big-screen and the small-screen. What a fun night! Hey Nancy! This one that Kelly Osbourne wore was my favorite. She looked stunning!